Homeowners and business owners want their property to look clean and beautiful. Unfortunately, your property may have some areas that just seem to attract grime. If you’re having a hard time keeping your property clean, you should consider getting regular power washing services in Cuyahoga Falls, Ohio. With regular pressure washing services, Cuyahoga Falls, OH residents, and entrepreneurs will not only boost their property’s aesthetic value but also ensure the safety of everyone entering and leaving the property. For expert pressure washing services in Cuyahoga Falls, OH, don’t hesitate to contact Wilhelm Power Washing. 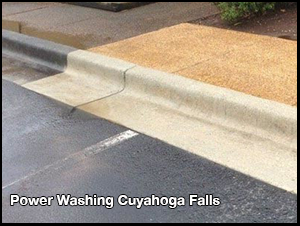 Since 1973, we have been providing professional pressure washing services to Cuyahoga Falls, OH residents. Your patio can accumulate moss, mold, and mildew. These growths are not only ugly but also dangerous, as they harbor germs and cause your surfaces to be slippery. Luckily, mold, mildew, and moss can be eliminated with regular pressure washing services in Cuyahoga Falls, OH. When you get regular pressure washing services in Cuyahoga Falls, OH, you won’t have to worry about these contaminants anymore. Professionals like Wilhelm Power Washing will always leave your patio, as well as other surfaces, fresh, new, and germ-free with our excellent pressure cleaning services for Cuyahoga Falls, OH residents. Maintenance is a huge part of being a property owner. With pressure washing services in Cuyahoga Falls, OH, you can keep your home or building in tip-top shape by washing away and preventing the growth of harmful contaminants that can eat away at your property’s integrity. With regular pressure washing services, Cuyahoga Falls, Ohio residents can rest easy knowing that any harmful growths or dangerous clogs will be washed away by experienced professionals. If you hire Wilhelm Power Washing for pressure washing services in Cuyahoga Falls, OH, you can expect your home to not only be completely clean but also fully protected from the damage brought by dirt and filth. After all, why wait for cleaning-related damage to deform your building and home? At Wilhelm Power Washing, our commercial and residential clients can rely on us to provide preventative maintenance with our pressure cleaning services in Cuyahoga Falls, Ohio. With frequent pressure washing services in Cuyahoga Falls, OH, there will be no chance of your home or building to get too dirty or run down in between our visits. If you keep to a regular schedule for pressure washing services in Cuyahoga Falls, OH, you can be sure that your property always looks inviting. When it’s time to sell your property, you definitely want your home or building to look good. In addition to paint touch-ups and replacements, pressure washing services in Cuyahoga Falls, OH, can make your property looking fresh. A high curb appeal means a higher number of interested buyers. With our pressure washing services in Cuyahoga Falls, OH, the process of making your home look beautiful will be quicker and easier. At Wilhelm Power Washing, we will be more than glad to provide pressure washing services for Cuyahoga Falls, OH homeowners and business owners. Do You Need Power Washing Services in Cuyahoga Falls, Ohio? Contact Us Today! Getting regular pressure washing services in Cuyahoga Falls, OH has several benefits and will extend your property’s lifespan. If you want to reap these benefits, then you should call Wilhelm Power Washing for pressure washing services in Cuyahoga Falls, OH today! With more than four decades of experience under our belt, you’re sure to receive top-notch pressure washing services in Cuyahoga Falls, OH. Contact us by calling 330-477-7094 for a same-day pressure washing quote. As a property owner, you want the exteriors of your property to always look clean and presentable. However, no matter how much you try, it’s inevitable that your home or office will become filthy. With the passing of time comes an accumulation of dust and dirt, as well as the growth of mildew, mold, or moss. These contaminants will not only make your property look dirty but also expose you to health risks. Before you or anyone else gets hurt, you should turn to Wilhelm Power Washing. With our expert pressure washing and painting services, we ensure that your property will start looking as good as new. We are committed to your satisfaction and safety; as such, we only use top-of-the-line equipment, paint, and cleaning solutions for each service we offer. Since 1973, Wilhelm Power Washing has been providing expert pressure washing and house painting services to both residential and commercial clients in Northeast OH. Our dedicated staff has more than 40 years of combined experience in the Cuyahoga Falls, OH area. With us, you can be sure to receive friendly and personalized customer care. We are not a franchise, so you’ll be in direct contact with our owner, Randy Wilhelm, each time you call us for a job. We guarantee that you’ll receive only the highest level of craftsmanship from our trained professionals. In our years of service, we have built a reputation for promptness, integrity, and reliability. No matter what job you called us for, you can expect us to be open and transparent with you every step of the way. At Wilhelm Power Washing, we specialize in power washing and house painting. When you hire us, you’ll be glad to find that our experts pay great attention to detail. We do our best to ensure that you get a quality job every time. With pressure washing, all the dirt and grime on your property will be washed away. Using high-pressure water blasts, heat, and soap, we can make your home look brand new. We don’t use just any soap, either; we utilize a safe, environmentally friendly, and biodegradable cleaning solution that not only removes stubborn stains but also keeps mold from returning! After a few years, the paint on your home will start looking dull. You can trust Wilhelm Power Washing to restore the vibrancy of your home with our professional painting services. Since we use first-rate Sherwin Williams paints on most of our house painting jobs, you can be sure that your home will be as bright and colorful as it used to be. You won’t be seeing any streaks or uneven layers if we’re on the job. In addition to offering our exceptional services at competitive prices, we also provide extra services—such as cleaning out your gutters—for free! However, if that’s not enough, you can visit our website and use the coupons and specials that we’ve put up. For example, first-time customers get 10% off any of our services. Every pressure washing job that goes over $750 gets free pressure edging of driveways and sidewalks! Senior citizens get discounts on whatever service they hire us for. When your house or office needs its look updated or its exteriors cleaned, don’t hesitate to get in touch with us. At Wilhelm Power Washing, we guarantee that you’ll be getting the best pressure washing and house painting services in Northeast OH. Rely on us to keep your home spotlessly clean and indescribably beautiful. Call 330-477-7094 today and receive a same-day pressure washing quote. We would love to hear from you!